$24.900 million on 1884 screens. When Robert Zemeckis last created a live-action film, Bill Clinton was still president. It’s crazy to realize that, but until 2012’s Flight, Zemeckis had only made animated movies since 2000’s Cast Away. I enjoyed much of Zemeckis’s work as a live-action director but felt less pleased with his generally unsatisfying animated fare. This meant I was eager to check out Flight and see how “live-action Zemeckis” circa 2012 would fare. Airline pilot Whip Whitaker (Denzel Washington) heads to the cockpit after a long night of drinking and drugging. The plane develops a severe malfunction that threatens the lives of all onboard, but Whip manages to land the jet with only a few fatalities. This should make him a hero, but when test results seem to point to his impaired state, Whip undergoes challenges. Whip meets recovering addict Nicole (Kelly Reilly) at the hospital and the two slowly bond, though they find themselves at different places in their willingness to deal with substance abuse issues. We follow their lives separately and together with a build toward a hearing to address Whip’s responsibility for the crash. For a little while, Flight provides a pretty intense affair. It starts well and keeps us with it through the airplane crash and its aftermath. I’ll say this for Zemeckis: he can stage an action scene – a similar sequence in Cast Away also offered a standout moment – and the sequences on the jet prove to be suitably harrowing. After that, unfortunately, Flight tends to meander. Honestly, much of the movie felt contrived and like a really long ad for Alcoholics Anonymous. I don’t mean that as disrespect toward the organization, but when a feature film plays like an elongated public service announcement, that doesn’t bode well for its dramatic or entertainment value. Actually, if you want to find a clear antecedent for Flight, you just have to look at the made-for-cable flicks you’d see on the Lifetime Channel. Leave out the “R”-rated elements and Flight easily could play on basic cable TV. Just retitle it Whip W: Portrait of an Alcoholic and get out the hankies! I must admit I also find Zemeckis’s tendency to pick predictable music choices to be a disappointment. This isn’t new to Flight - Forrest Gump veered toward obvious song selections – but it’s still a letdown, as the tunes heavily telegraph themes/emotions. “Under the Bridge” and “Sweet Jane” for the heroin scene? “Sympathy for the Devil” when the sleazy drug dealer enters? That’s the best Zemeckis and company could do? When Flight deals with the plane crash and its aftermath, it fares quite well. This is where Zemeckis shows his strongest talents, as he’s always been better with action/”showy” material than with characters or drama. Unfortunately, those elements constitute little of Flight, so we’re usually stuck with Whip’s various misdeeds. These tend toward a “lather, rinse, repeat” feel before long, as the movie follows a predictable path with little to make it involving or impactful. Throw in a contrived, unsatisfying ending – among many contrived, unsatisfying sequences that stretch credulity - and I can’t find much to like about Flight. After a lively opening, it degenerates into so much TV movie fodder and becomes a snoozer. 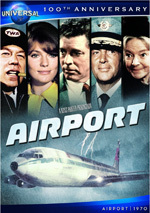 Flight appears in an aspect ratio of approximately 2.35:1 on this Blu-Ray Disc. I felt pleased with this solid transfer. At all times, sharpness looked strong. The slightest amount of softness appeared during interiors, but those instances remained minor. Overall delineation was positive. Jagged edges and shimmering failed to appear, and edge haloes remained absent. Source flaws also caused no distractions. For the most part, the film went with a subdued palette that favored a mild amber tint or a blue overlay, depending on setting and tone. The hues looked appropriate within those parameters and seemed solid. Blacks were dark and tight, while shadows demonstrated good clarity. I thought the image looked very good. The DTS-HD MA 5.1 soundtrack wasn’t quite as strong, but it seemed pretty good. As expected, the mix came to life best during the big plane crash sequence; that one used all five channels to involve us in the situation, so it provided a terrific segment. That was about it in terms of impressive auditory elements, though – which made sense, as the rest of the movie concentrated on character moments. The track fleshed out the spectrum with a nice sense of atmosphere that worked for the story. Audio quality was always strong. Music sounded full and dynamic, while speech was concise and natural. Effects displayed positive accuracy and range, with solid clarity and power. Though not a sizzling track, the audio suited the film. A few extras fill out the set. 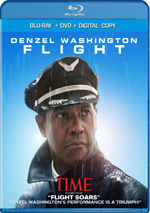 Origins of Flight runs 10 minutes, 29 seconds and features notes from writer John Gatins, director Robert Zemeckis, producer Steve Starkey, and actors Bruce Greenwood and Denzel Washington. We learn about the script’s roots as well as the project’s development, characters and story, casting, and a few connected issues. At no point does “Origins” provide a meaty program, but it gives us enough interesting notes to be worth a look. During the 11-minute, 31-second The Making of Flight, we hear from Zemeckis, Washington, Gatins, Starkey, Greenwood, flight trainer Larry Goodrich, production designer Nelson Coates, aircraft mock-up provider Dave Scroggins, and actors Don Cheadle, Kelly Reilly, and Brian Geraghty. We go over cast, characters and performances, sets and locations, research, Zemeckis’s work on the shoot, production design, and other notes. Like “Origins”, “Making” gives us a perfunctory but reasonably informative program. Anatomy of a Plane Crash occupies seven minutes, 46 seconds with info from Gatins, Zemeckis, Starkey, Coates, Washington, Goodrich, Cheadle, visual effects supervisor Kevin Baillie, stunt coordinator Charles Croughwell, and special effects supervisor Michael Lantieri. This one looks at research and realism as well as all the effects and other elements required to create the movie’s big crash sequence. Perhaps because it covers the movie’s most exciting section, this ends up as the strongest of the various featurettes. Finally, we find Q&A Highlights. This 14-minute, 18-second piece offers panel statements from Zemeckis, Geraghty, Gatins, Cheadle, Greenwood, and actors Tamara Tunie, Melissa Leo, James Badge Dale and John Goodwin. The session examines the movie’s influences and development, its path to the screen, story/character topics, training and thoughts about the air travel industry, cast and performances, thoughts on particular scenes and a few other areas. A get a decent collection of comments here, but the format becomes a distraction; this would’ve been more enjoyable if we’d gotten a more complete Q&A without so many edits. 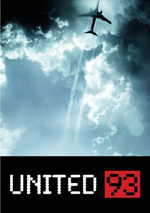 A second disc provides a DVD copy of Flight. This includes some previews but throws in no other extras. After a 12-year absence from live action films, I hoped Robert Zemeckis would return with a bang. However, outside of a few good sequences, Flight lacks much merit, as it rarely turns into anything more than trite melodrama. The Blu-ray delivers excellent visuals and positive audio but lacks substantial supplements. Maybe Zemeckis’s next flick will be more satisfying.